The Night Journey (2007-2018) was one of the first experimental art games ever made. It uses both game and video techniques to tell the universal story of an individual’s journey towards enlightenment. The game begins in the center of a mysterious landscape on which darkness is falling. There is no one path to take, no single goal to achieve, but the player’s actions will reflect on themselves and the world, transforming and changing them both. If they are able, they may slow down time itself and forestall the fall of darkness. If not, there is always another chance; the darkness will bring dreams that enlighten future journeys. The interactive design of The Night Journey evokes a sense of the archetypal journey of enlightenment through the mechanics of the game experience – i.e. the choices and actions of the player during the game. The game design explores a challenging question: what is the game mechanic of enlightenment? How can we model such an intensely personal yet archetypal experience in a game? Visual inspiration is derived from the prior works of Bill Viola, which provide reference for the game world, while source material for the in-game “reflections” is drawn from the vast archive of his video footage. Textual inspiration comes from the lives and writings of great historical figures including: Rumi, the 13th century Islamic poet and mystic; Ryōkan, the 18th century Zen Buddhist poet; St. John of the Cross, the 16th century Spanish mystic and poet; and Plotinus, the 3rd century philosopher. The team has created a set of custom post-processing techniques for the 3D environment that give a sense of “explorable video,” integrating the imagery of Bill Viola’s prior work into the game world at both a technical and creative level. The Night Journey debuted in the SIGGRAPH art gallery in 2007 and has continued to be exhibited worldwide for the past ten years, The project stands as a milestone in the search to expand the boundaries of what game experiences may communicate through their game mechanics and world design. In June of 2018, The Night Journey was made available for home players on PlayStation 4, PC and Macintosh. Bryan Appleyard of The Sunday Times called it "...the most genuinely realistic game ever made. It is like life: puzzling, difficult, uncertain, unclear, always seen, in St Paul’s words, through a glass darkly." ZKM_Gameplay, exhibition view, ZKM | Center for Art and Media Karlsruhe, curated by Stephan Schwingeler, photo © Tobias Wootton. IndieCade Presents: A Decade of Game Design, Museum of the Moving Image, Queens, New York (February 15, 2018 - June 17, 2018) Curators: Sam Roberts and Mattie Brice. 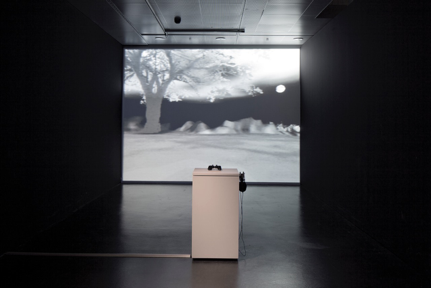 The Night Journey was a collaboration between Bill Viola and the Game Innovation Lab, including award winning game designers Tracy Fullerton and Todd Furmanski. Kira Perov, Tracy Fullerton and Bill Viola at the Game Innovation Lab, working on The Night Journey. Copyright © 2007–2018 USC Game Innovation Lab. All Rights Reserved.